Congratulations to Tama Karate competition team on their last competitive outing. Our Tama black belt instructor Greg Dinsmore lead the team to Miami Valley Tournament Association first tournament this year in February 3rd held at Crown Plaza hotel downtown Dayton. Greg Dinsmor has been training in the martial arts of Tama Ryu Kempo Karate for over 22 years. He has cross-trained in many different martial arts such as Silat, Wing Chun, kickboxing, Shorin-Ryu Karate, Aiki and Kung-Fu. Greg volunteered to take the team this year and help train them and take them to the MVTA competition events. GM Taningco has given him the blessings to lead the Team Tama. This is his first year of competition along with the team. He is one of our consistent instructor that helps teach our children mighty might program during the week. His daughter Alexandra is also in the mighty might class. Greg brings the team together every Friday night for team practice at 7 pm till 8 pm. He drills the team on the categories of forms competition, weapons forms competition, and sparring competition. Any Tama member can join to be able to compete in the karate competition. 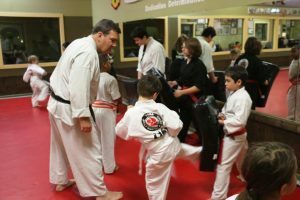 Greg helps them prepare for the presentation and understand the game of karate competition on all aspects of the karate sport. There will be some traveling for the karate competition team. We acknowledge the parents having to bring them to practices and to travel to competitions. Thank you, parents. Tama students learn the intricacies of sparring for point systems. Although, at our training, continuous sparring is what is emphasized for self-defense and being able to flow from offensive combinations and defensive combinations. Being able to take the hit other than giving one. It helps the students react differently compared to competitive points. Although competitive points in karate have advantages because of quick decisions and being able to be the first to hit the person without getting hit to score a point. In continuous sparring has both attributes of being the first one to score and being able to do combinations and your sparring partner. On the point system, the point is called when judges see a good call and stop the match. On continuous sparring, both sparring partners continue on until the coach says stop or change partner. However, there is continuous sparring competition in larger competition tournaments in which both have participated and watched. In both Forms (Kata) and Weapons Forms competition, one must have a good focus with a good stance and strong techniques. Balance, the timing of execution of each technique and the tenacity of a tiger with a crisp turn of the head, without hesitation when performing a Kata or Weapons Kata. The presentation is one of the keys in this particular category of competition. The karate competition team of TAMA has done very well in the past many years for the last 43 years. They have brought many Grand champion trophies home and gold medals and many have gone to both National, International, and World Competitions. There are many to lists and many have gone very successful in their life. The Team Tama has traveled to all over USA, Russia, Estonia, China, Taiwan, and Canada.